After a long wait back for tata nano, it finally found its home at Gujarat,Sanand.There was a joint statement made by Gujarat Chief Minister Narendra Modi and Ratan Tata about the Nano project at Gujarat.So ultimately for all controversies they gave an end. 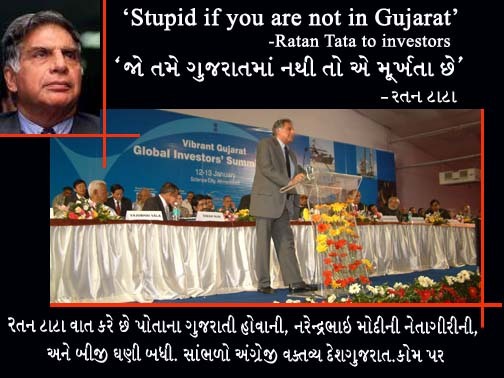 After the talks between Tata and West bengal CM failed , Ratan Tata decided to relocate its project from singur to someother state.Many states were offering Tata to make its Nano project in their state.It was also said that Tata is going to prefer Karnataka and the Andhra Pradesh.But finally it was Gujarat were Tata is going to relocate its Nano Project.Tata really had a huge loss because of Singur issue and nearly 1000 crores were under loss.After the assurance made by the Gujarat CM Narendra Modi that there will be no labour unrest,Tax SOPS and 1050 acres of land, Ratan Tata decided to make a move to Gujarat.Narendra Modi also assured Tata that there will be no agitation against the project as it happened in West Bengal..It is obvious that Narendra Modi is the undefeatable king in Gujarat and even that may be the reason why Tata preferred Gujarat for Nano. On a press meet,Ratan Tata announced the after the sad experience in WestBengal, this might be a good news for their employees and contractors.He also said that there will a initial production of 250 to 300 units in the near future commissioning project.After that more units will be produced.The most important of all was that there will not be any impact on the cost of the small car.Tata also said that it is stupid if investors are not in Gujarat After along wait, now Tata found a real good place where everything could be fine.This made a feel among the investors that Gujarat might be a safer place for investments.